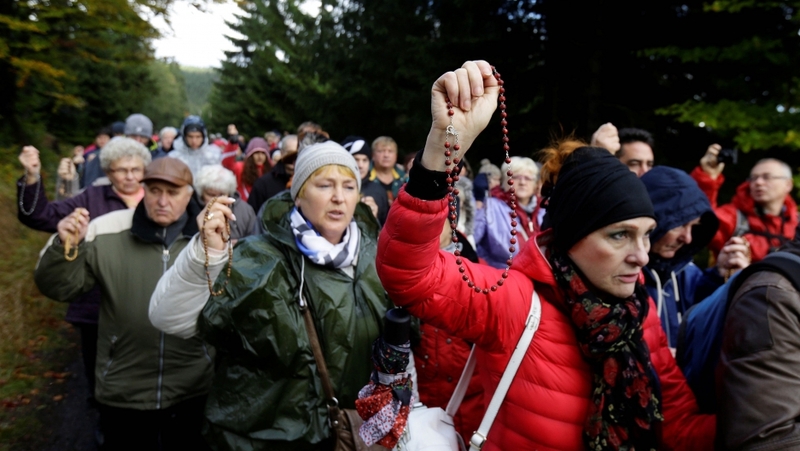 People pray as they walk through the forest during a mass rosary prayer on Polish-Czech borders near the village of Szklarska Poreba, Poland, Oct. 7, 2017. Thousands of Polish Catholics formed human chains on the country's borders Saturday, begging God "to save Poland and the world" in an event many viewed as a spiritual weapon against the "Islamisation" of Europe. Reciting "Rosary to the Borders", they called to be protected from the dangers facing them. The episcopate insisted that it was a purely religious initiative. The goal was to have as many prayer points as possible along Poland's 3,511-kilometre (2,200-mile) border with Germany, the Czech Republic, Slovakia, Ukraine, Belarus, Lithuania, Russia and the Baltic Sea. Fishing boats joined the event on the sea, while kayaks and sailboats formed chains on Polish rivers, local media said. During a mass, broadcast live by the ultra-Catholic Radio Maryja, Krakow archbishop Marek Jedraszewski called on believers to pray "for the other European nations to make them understand it is necessary to return to Christian roots so that Europe would remain Europe." Archbishop Stanislaw Gadecki, head of the Polish Episcopal Conference, told the commercial radio station RMF FM that "the key objective of this manifestation is to pray for peace." A victory attributed to the recital of the rosary "that saved Europe from Islamisation", the Solo Dios Basta foundation, organising the event, said on its website. Nationalist Catholic activist Marcin Dybowski told AFP before the event that "a religious war between Christianity and Islam is once again underway in Europe, just like in the past." "Poland is in danger. We need to shield our families, our homes, our country from all kinds of threats, including the de-Christianisation of our society, which the EU's liberals want to impose on us," he said. Twenty-two border dioceses have taken part in the event, with their faithful congregating in some 200 churches for a lecture and mass before travelling to the border to say the rosary. The prayers were also said at the chapels of several international airports. Polish parishes abroad said they would join the event too.